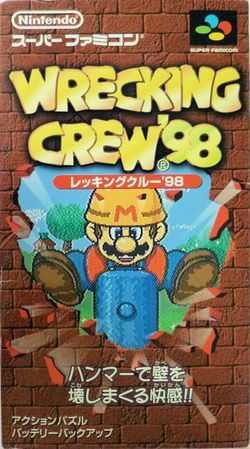 Wrecking Crew '98 (レッキングクルー'98) is a puzzle video game developed and released by Nintendo for the Super Famicom in May 1998 for Japan only; it is the sequel to the Nintendo Entertainment System game Wrecking Crew, and was later released as part of the Nintendo Power flashable cartridge service in January 1998. The game takes on a more competitive approach, featuring puzzle elements akin to games such as Tetris and Puyo Puyo, such as being able to rain down panels on the opponent's side and chain reactions. The game also includes a direct port of the NES version. The game was never released outside of Japan due to Nintendo's international divisions ending the sale of SNES games the previous year in 1997. The game would later be released in Japan for the Wii U Virtual Console on September 28, 2016. Mario, on his way home from a trip, discovers that Bowser has been conducting a construction campaign of building high-rises in the Mushroom Kingdom, which are depriving the local plantlife of sunlight. Refusing to tolerate this, he brings out a mighty blue hammer from a chest inside his house and embarks on a mission to demolish the offending structures. Mario's old nemesis, Foreman Spike, along with several other foes from the original game, are out to stop him. Luigi vs. a Koopa Troopa. 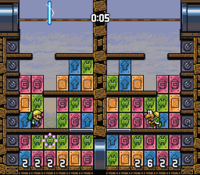 Players must eliminate their panels by either demolishing them with the hammer or arranging three or more colored panels in a vertical or horizontal fashion. They can arrange their panel accordingly by using the handles located on the corner. As time passes on, one brick panel will fall in. The longer a match goes, the more often brick panels start falling in. If four or more panels are arranged, then an obstacle or trap will be sent to the opponent's side, depending on the panels' color. If more than one set of panels are eliminated in a row, then the attacks to the other side will grow stronger. Players can also summon additional rows of panels on their side when needed. When the field is all clear, the message "Nice!" will appear and a Mushroom is received. The Mushroom acts as an Attack Multiplier, increasing the strength of the next combo toward the enemy. The opponent can be defeated only when the number of panels in a column exceeds the line atop the screen. If the panels are not eliminated within 3 seconds, then the opponent will lose and the player will be declared the winner. However, a draw can occur if both players exceed the line and fail to lower their panel field in 3 seconds. Brick Panel, a panel covered by bricks. When struck, it will turn into a colored panel. Pink Panels (welding mask), when combined, will summon an enemy to the opponent's side. A player running into the summoned enemy will be paralyzed for a short time. Blue Panels (shows arrow pointing up), additional panels will emerge from the ground from an opponent's column. Blue Combo Attacks are easily countered and are only useful as a "Finishing Attack". Yellow Panels (looks like a rectangle), will summon metal plates from the air to the opponent's side. These cannot be destroyed with the hammer. Yellow Combo Attacks are powerful and dangerous in the fact that if the player constantly performs them, they can flood the opponents field with Metal Plates to the point where he can't set up any more combos. Green Panels (an arrow pointing both ways horizontally), will turn all panels into brick panels from two or more rows on the opponent's side. The type of colored panel behind the brick panels will change as a result. Bomb Panels, will destroy everything horizontally and vertically from a two-panel span. If another bomb is struck during the explosion, then it will cause a chain reaction. These only appear randomly when the player manually summons more panels in from above (default ); thus, a player needs to have one's area sufficiently cleared to summon bomb panels or risk losing the match. Metal Plates, panels that cannot be demolished by hammer and can only be dealt with by moving them using the handle on the left-hand side or by destroying them with a bomb. Mario The protagonist of the game. Available from the start in multiplayer mode. Eggplant Man The opponent of Stage 1. Available from the start in multiplayer mode. Koopa Troopa The opponent of Stage 2. Defeat him to unlock him in multiplayer mode. Gotchawrench The opponent of Stage 3. Defeat him to unlock him in multiplayer mode. Foreman Spike The opponent of Stage 4. Defeat him to unlock him in multiplayer mode. Bowser The opponent of the final stage. Defeat him to unlock him in multiplayer mode. Princess Peach Appears in the game's ending. Defeat Bowser to unlock Peach in multiplayer mode. Luigi Appears in the game's ending. Defeat Bowser to unlock Luigi in multiplayer mode. Onigiri A living ball of rice and the opponent of Stage A. Defeat Koopa Troopa in four minutes to unlock Stage A, then defeat Onigiri to unlock it in multiplayer mode. Onnanoko A little girl and the opponent of Stage B. Defeat Gotchawrench in three minutes to unlock Stage B, then defeat Onnanoko to unlock her in multiplayer mode. Oyazi A depressed man and the opponent of Stage C. Defeat Foreman Spike in two minutes to unlock Stage C, then defeat Oyazi to unlock him in multiplayer mode. Dogu A clay figure and the opponent of Stage D. Defeat Onigiri, Onnanoko, and Oyaji to unlock Stage D, then defeat Dogu to unlock him in multiplayer mode. The enemies are themed around construction, such as forklifts and workers, and are summoned to provide assistance by crowding the opponent's playing field and obstructing their ability to move around freely without running into them. They disappear when they reach the warp pipe in the center-bottom of the screen and the player who receives them can get rid of them faster by jumping on them. The speed and number of enemies summoned depends on the size of the combos and the number of chains that are performed with Pink Panels. Forkun A forklift that cruises around the stage, stopping momentarily to raise its fork. Only appears in chains involving three Pink Walls. Blonya A masked white creature carrying a cement block. Appears in combos of four Pink Walls. Buruccho A bulldozer that cruises around the stage, stopping momentarily to raise its front end. Similar to Forkuns, but slower. Appears in combos of five Pink Walls. Burnya A slower variety of Blonyas brandishing wielding tools and walking backwards. Appears in combos of six Pink Walls. Dumpty A dump truck that cruises around the stage, stopping momentarily to tilt its back end. Similar to Forkuns and Burucchos, but even slower. Appears in combos of seven Pink Walls. Jenya the slowest of the Blonya family, flying with a jetpack and stopping momentarily to throw cement blocks. Appears in combos of eight Pink Walls. Kanbank The most fatal enemy of them all. It is actually a sign of Bowser that's six walls wide and more than six walls tall, immediately ending the game of the opponent of the player that summoned it. Appears in combos of at least nine Pink Walls, thus very hard to get. Guruccho A screwdriver that appears only in chain sequences. Paired with Forkuns or Blonyas. Gata Gata A roadblock that appears only in chain sequences. Sometimes stops momentarily to let the sign on it swing. Paired with Burucchos or Burnyas. Poles A series of three poles that appear only in chain sequences. Paired with Dumpties. U Dokun A standee of a construction worker that appears only in chain sequences. Sometimes stops momentarily to put its arm up. Paired with Jenyas. For a complete list of media for this subject, see List of Wrecking Crew '98 media. This page was last edited on April 21, 2019, at 02:45.